Well made of high-end material, our TOOLTOO pry bar is perfectly ideal for nail and tack pulling. Ergonomic Design- Pry ball is Smooth shape in line with human mechanics, quite comfortable to hold, effectively protects your hand from hurting during work. Superior Material- Well made of carbon steel, crafted with spray paint treatment, extremely wear-resistant and corrosion resistant. 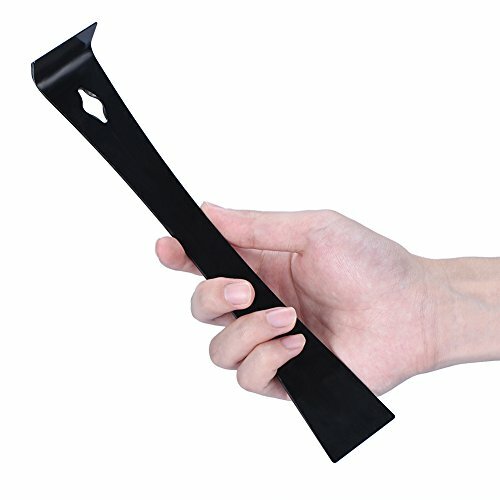 High Performance- With sharp scraper edge, allow you to enjoy effort-saving and time-saving using experience. Perfect Tool- Ideally greatly for pulling nail and tack, makes your work more convenient and efficient. Wide Application- Pry bar is for narrow space like wall, ultra easy and handy to use. If you have any questions about this product by TOOLTOO, contact us by completing and submitting the form below. If you are looking for a specif part number, please include it with your message. Stanley FMHT55011 FatMax Utility Bar, 17"